UK Release Date - 30th March 1992. US Release Date - 31st March 1992. UK Release Date - 7th December 1992 (CD/LP Picture Discs). Producer/Engineer/Mixer - Mike Shipley/Def Leppard. Executive Producer - Robert John 'Mutt' Lange. Acoustic Guitars - Phil Collen/Rick Savage (Tonight). Cockney Rhyming Rap - Phil Collen (Make Love Like A Man). Keyboards - Philip Nicholas (Stand Up). Backing Vocals - The Sideways Mob (Def Leppard/Mutt Lange/John Sykes/Dave Steele). Studio - Studio 150, Amsterdam, Holland. Live Tracks - Recorded 29th May 1992 in Bonn, Germany. Special Formats - UK Limited Edition (5000 only) 12 Inch Picture Disc Edition with 2 bonus tracks. Special Formats - UK Limited Edition CD Picture Disc Edition with Gatefold Digipak sleeve/2 bonus tracks. Special Formats - Japanese Mega Edition featuring 'In The Clubs-In Your Face' CD. The fifth studio album released by the band. The album followed on from the tragedy in 1991 of Steve Clark's death and was finished off as a tribute to his memory. 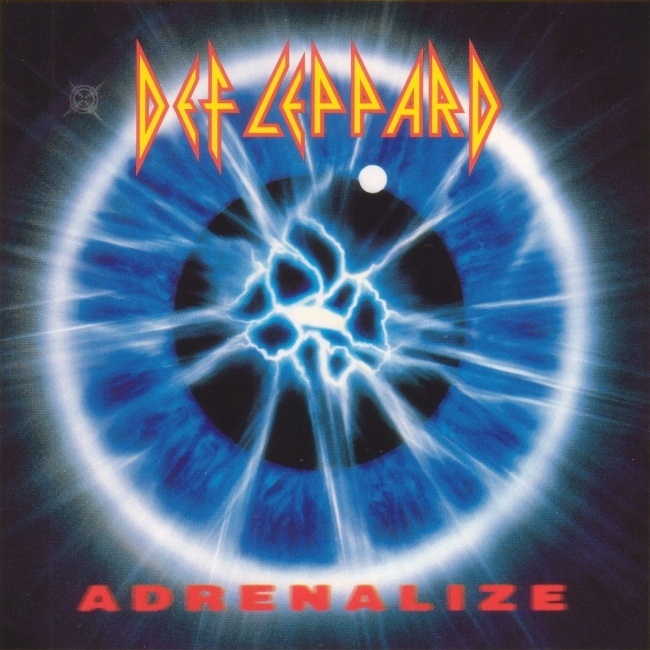 He co-wrote six of the songs and his guitar parts were played by Phil Collen as well as his own making this the only album the band recorded as a four piece. A one page tribute message to Steve was included in the inner booklet. It went on to sell over 7 million copies world wide. Seven singles/videos were released in various forms around the world including the biggest hit 'Let's Get Rocked'. The album debuted at number 1 in both the UK and USA where it stayed for 5 weeks. Although co-writer for nine songs Mutt Lange did not produce the album. He was listed as Executive Producer and helped out via phone as well as contributing some backing vocals. The albums cover art featured an excited eye (adrenal - eyes) which was a picture of a human eye, model Miles Kendrick, later enhanced with computer imaging by Satori. Miles had his eyelids sellotaped open and his head stuck to a serving hatch while the picture was taken. Bruce Springsteen's sister Pamela took the band photographs for the inner booklet. The gun/target sight image returned and was seen on the top left of the cover. First seen as the O in Pyromania it was also used in the center of the Hysteria cover. The band included a re-recording of Hysteria B-Side 'Tear It Down' due to it's popularity after the 1989 MTV Awards. 'I Wanna Touch U' was the first song co-written by Rick Allen since 1981's 'Lady Strange'. On 7th December 1992 a special Limited Edition picture disc was released in the UK on LP and CD. The CD version featured previous B-Side 'Miss You In A Heartbeat' and future B-Side of Heaven Is 'She's Too Tough' as extra tracks. At the same time this was also issued in Japan (no picture disc) along with a Mega Edition featuring these two tracks on CD1 and the 'In The Clubs-In Your Face' Live E.P. on CD2. Plus a Japanese biography and album lyrics. Unlike other albums initial Japanese copies were only the normal 10 track version.